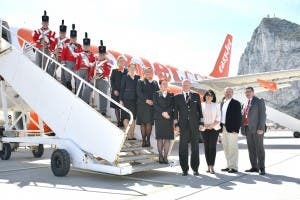 AFTER months of anticipation, Europe’s leading airline Easyjet launched the Gibraltar – Bristol service on 19th April 2015. The inaugural flight took 147 passengers from Bristol to Gibraltar and the 156-seater A319 aircraft should attract 39,000 visitors per year. The new route is due to operate three times per week on Tuesdays, Thursdays and Sundays throughout the year. Ashley Fox, MEP for the South West of England & Gibraltar, said: “Gibraltar has always been a bastion of British culture and the gateway to the Mediterranean.